Saudi Aramco’s drive for continuous improvement and excellence was recognized last week as our teams and individuals took home a total of five awards from the 2018 Oil and Gas Awards Middle East in Dubai. The event represents one of the most prestigious awards organizations in the industry, highlighting the accomplishments and game-changing ideas of the top players in the GCC region. Flaring Project. From left are Mohannad A.
Mohammed T. Utaibi (winner), and Rami R.
Leading the way this year, the Yanbu’ NGL Fractionation (YNGLF) Department was awarded the Operational Excellence (OE) Strategy of the Year award. With the intent to govern its performance and processes, YNGLF adopts a set of key principles that have instilled the OE culture among its employees, toward meeting stakeholders’ expectations, and contributing to the achievement of long-term sustainable success. “Operational Excellence is central to achieving the company’s strategic objectives, and is delivering tangible results at YNGLF,” said Faisal A. Al-Subhi, YNGLF manager. “We are entering an era where full implementation of OE is the path forward to keep us ahead of the curve. From the left are Ali A. Alyousef, Ammar J. Capture Storage and CO2 EOR Pilot Project. Taking the HSE (Health, Safety, and Environment) Initiative of the Year award, Saudi Aramco’s EXPEC Advance Research Center (ARC) impressed judges with both the environmental benefits and the cost efficiency of its carbon capture, utilization and sequestration through the Carbon Dioxide Enhanced Oil Recovery (CO2 EOR) Pilot Project. The mitigation of CO2, a greenhouse gas, is at the center of this pilot project. By capturing and injecting about 2,000 tons of CO2 every day into subterranean formations, Saudi Aramco is having a positive impact on the environment — the equivalent of removing 170,000 vehicles from the road per year. It is an example of a “win-win” project: A win for the environment by storing CO2 and a win for additional oil recovery if needed in the future. The project is a long-term resource planning strategy and an approach to protect the environment. 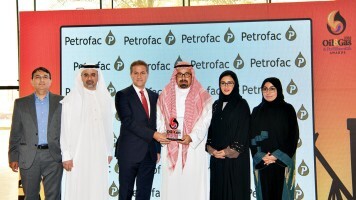 For Technical Innovation of the Year, Saudi Aramco’s EXPEC ARC shared the award for its Waterflood Monitoring with Surface-to-Borehole Electromagnetics with the company’s strategic partner, Schlumberger. Saudi Aramco’s Reservoir Characterization Dept. Waterflood monitoring helps the company overcome one of the major challenges in tracking the movements of fluids in the subsurface. Through its joint project with Schlumberger, EXPEC ARC scientists applied for the first time a new surface-to-borehole electromagnetic (EM) technology for waterfront monitoring around wells. The implementation of touchless capacitive EM sensors permanently installed in the reservoir provides the configuration for continuous reservoir monitoring. The development of the technology led to one granted patent and two more patent filings from Saudi Aramco. Saudi Aramco also received the Training Initiative/Program of the Year award for its “Geoscience Train” Program. The 18-month program focuses on building the strengths of young employees in geology and geophysics through a mix of educational courses and field applications. tasks in the oil and gas industry. It selects mentors from different specialties and backgrounds to align ideas with expertise and close the scientific gap between the new and seasoned employees. This enables the new generation of geologists and geophysicists to deliver new and innovative solutions to address challenges facing Exploration. Rounding out the event, Mohammed A. Al-Ghazal, an operations supervisor with the ‘Uthmaniyah Gas Plant, received the Young Oil and Gas Professional of the Year. 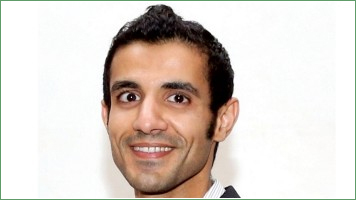 Al-Ghazal earned the award for his work in secured digital transformation, which includes developing novel machine learning models to streamline error prone, human intensive and repetitive tasks in the oil and gas industry. Machine learning not only improves reliability; it also saves time and helps in improving safety performance and environmental stewardship by sending alert messages to staff for proactive mitigation and control.